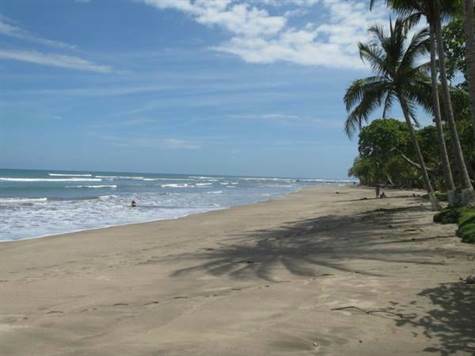 Absolute Best Ocean View lot located in a gated community called Costa Esterillos. The lot is serviced by underground utilities, private brick paved roads. This is one of the few areas along the Esterillos coastline where one can have titled property with white water views with easy access and underground utilities. The lot measures 3498 M2 and has a very nice building pad allowing one to take in the beautiful Ocean and Mountain views. Given the size of the lot, one can build a pool area and plant an organic garden as the climate and soil are ideal. Also, this property is located next to acres of designated green areas of the gated community thus offering more privacy and natural fauna which has made Costa Rica so popular. There is an abundance of tropical birds, monkeys, pizotes and many other native species migrating through this property. The title is clean and is currently in a corporation and the property taxes are minimal. There are low HOA fees which include road maintenance, landscaping and security. Electricity and water are to the property and there is a $500k plus house next door shown in one of the pictures. The second house shown is brand new and down the road as there are 15 luxury homes built. Price $110,000 or $32/M2 .